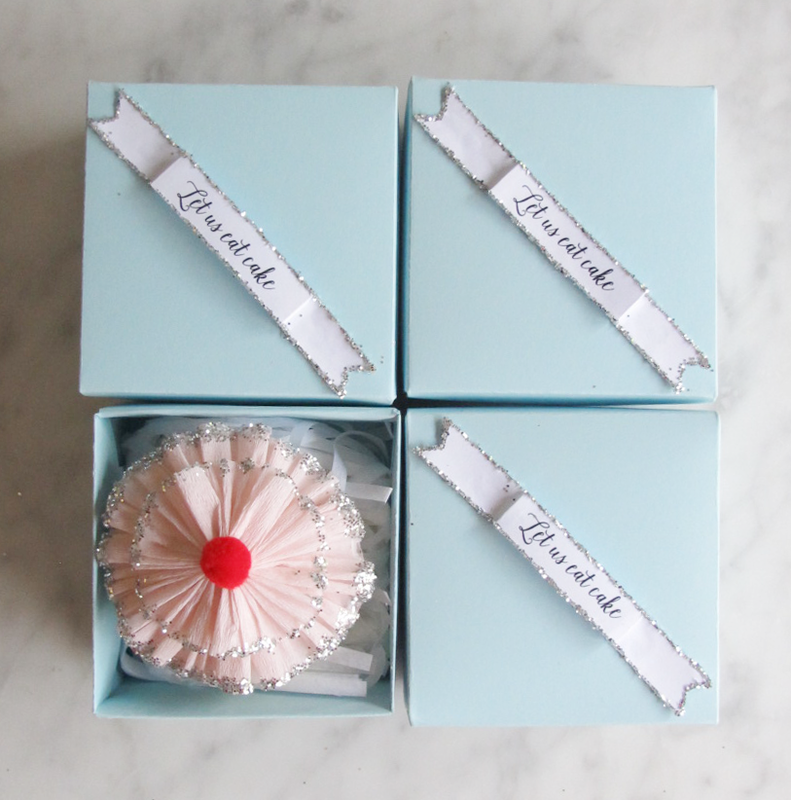 Here is a fun little tutorial with a free template for making a cupcake that is a box! I made these for Miranda's birthday invitations. The invite is curled up inside. Miranda has asked for a princess party, which is fine by me. I was just struggling for inspiration. So I am overlaying the princess theme with a Marie Antoinette theme. I nestled the cupcake box in another regular square box on a bed of paper shreds. 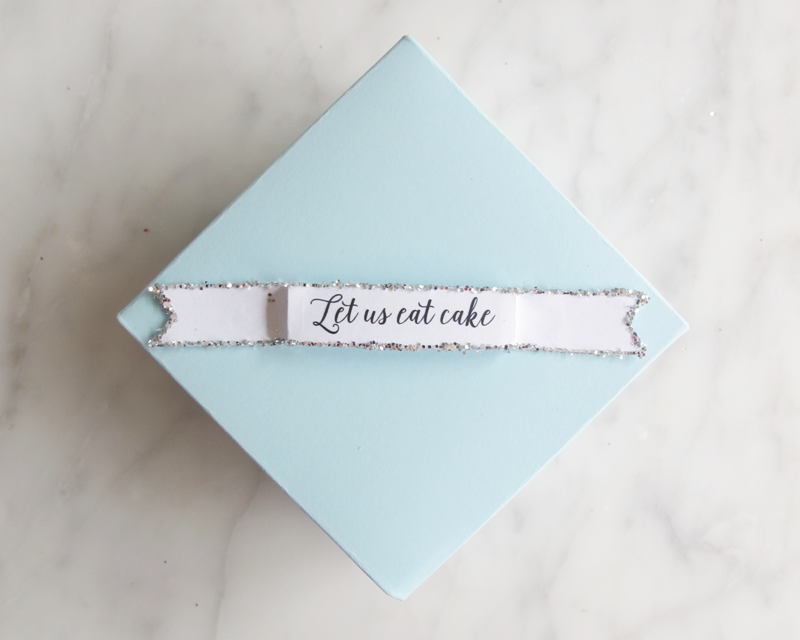 Finally, I added a tiny "Let us eat cake" glittered banner as a final touch so the recipient knows there is something special inside! So yep, glitter is everywhere and on everything in our house, because Miranda helped make these. Just download the template and follow the instructions below to make your own cupcake boxes, or boxes that look like cupcakes. Call them what you want! Cut BASE Pieces A and C from the glitter paper. Using the sticky tape stick the two base pieces together. The sides have two tabs that overlap as they meet the other side. Just stick them with tape on the inside. The base has tabs that need to be folded upward so you can tape the base to the sides (again, on the inside). Cut TOP Piece B from the white cardboard or adhesive foam. The bold lines are the cutting lines. The dotted line is an overlapping guide. Overlap the edges of the cut that leads to the middle of Piece B, so that it takes on a slight cone shape. Stick with tape. The adhesive foam will stick to itself once the backing is peeled away (the sticky side needs to be facing up). 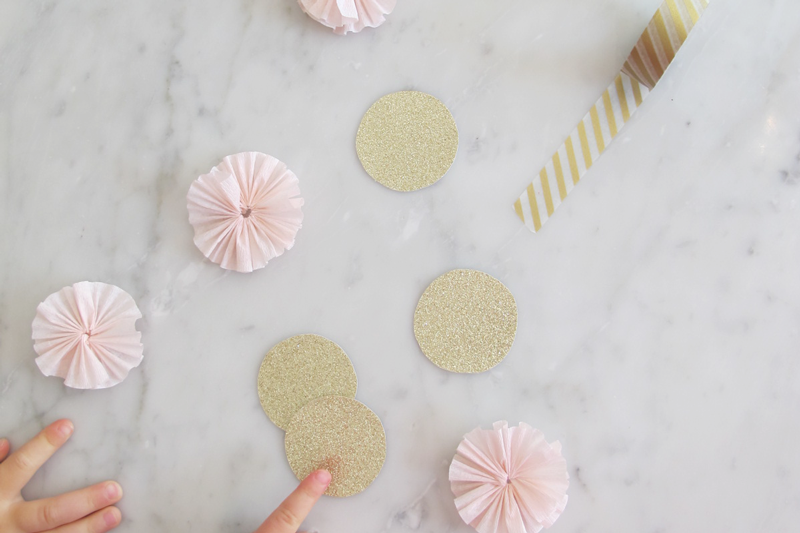 Now you can decorate your cupcake! 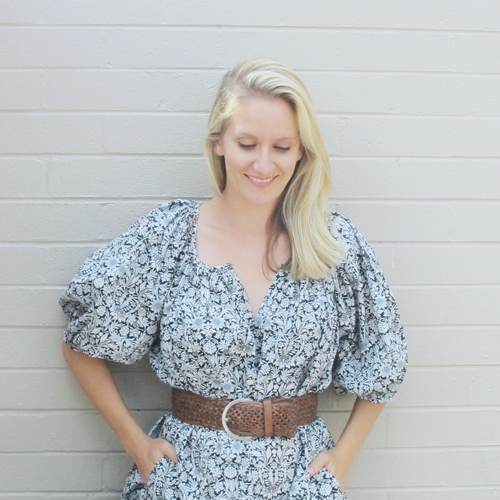 Make two crepe paper rosettes, one large and one small. 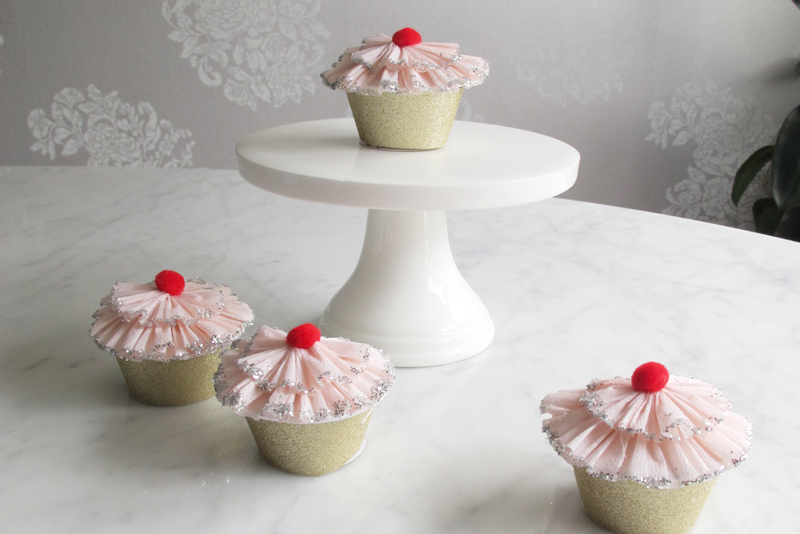 The large rosette needs to be slightly larger than the cupcake top. The small rosette needs to be about half that width. Make the rosettes by carefully hand sewing through the edge of a strip of crepe paper gathering as you go until it is a full rosette. Glitter the rosettes by dipping just the very edge in craft glue and then glitter, rotating as you go. Dip, dip, rotate! You can do this all on the paper plate. Note that crepe paper doesn't like glue, so go easy. 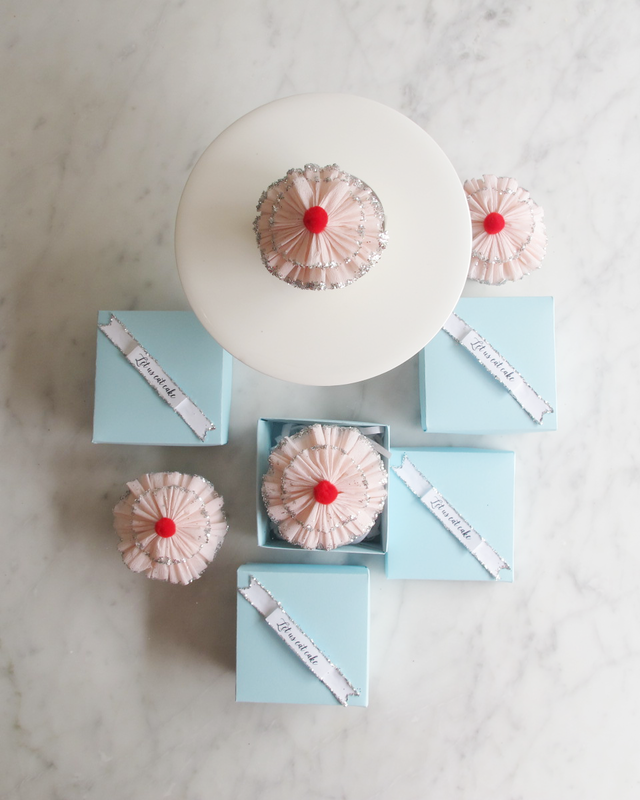 Sparingly glue the rosettes onto the cupcake top (or just push gently onto the sticky foam). Top with a red pom-pom cherry and let dry while you go and have a rest.